I’ve had this sauerkraut sitting in the cupboard for a few months now and it was time to use it up. Too hot to make bigos (sauerkraut, meat and sausage stew that for best results is cooked over 6 hours) but cool enough to enjoy a handful of dumplings. Always a pleasure. Having said that, sauerkraut is an acquired taste. The lightly stewed kraut tastes a little like caramelised sweet and sour onion, and is a traditional dumpling stuffing for Christmas Eve (pierogi or uszka served with clear borscht). The sweetness of the soup goes really well with the sour and earthy flavours of the dumplings. And they are so much fun to make! If you think that sauerkraut may not your cup of tea, you can try other dumpling stuffing ideas. 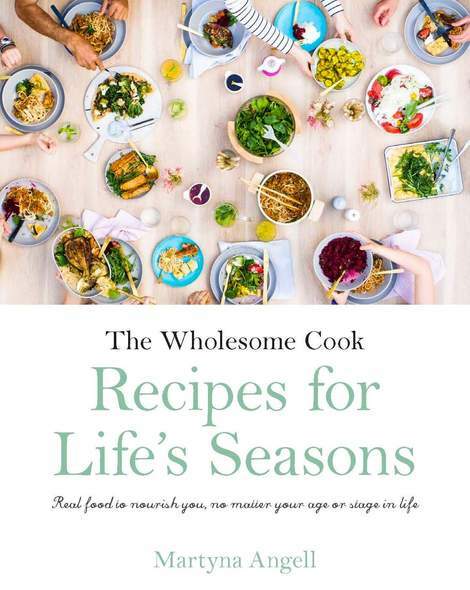 1 packet round gow gee wrappers or Gluten-free Dumpling Skin recipe features in The Wholesome Cook cookbook. Soak porcini in half a cup of warm water until soft. Chop into fine pieces using kitchen scissors. Place sauerkraut, mushrooms with the soaking water and spices in a saucepan. Add extra cup of water and simmer gently for about 30 minutes, stirring from time to time, until the water evaporates. Remove bay leaves and allow to cool before spooning mixture into dough. 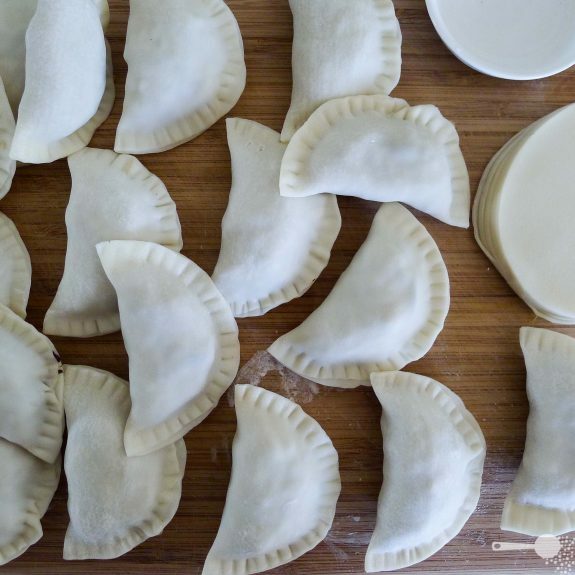 To make the dumplings, place 1 heaped teaspoon of the mixture in the middle of the pastry circle, fold dough over and pinch the edges together – brush with a little water to help the edges stick. Cook dumplings in boiling water for 4 minutes, stirring occasionally to prevent them from sticking together or to the bottom of the pot. Serve immediately, or chill, store in the fridge and reheat by frying up on both sides. Best enjoyed with a cup of clear borscht soup. yummy, although I’ve never had sauerkraut IN dumplings before! It reminds me of being in Eastern Europe. Your dumplings look spectacular! Thanks Heidi, they are Eastern European. Although there’s usual quarrels over which nation should call it their own: Poland or Russia. I can’t wait to make this recipe!!! I love sauerkraut but find it’s often served with unhealthy foods. I was wondering if I could make a large batch and freeze them prior to steaming or boiling them? I’m just not sure how the rehydrated porcini will freeze? Hi Lyndsey, yes you can freeze them! The mushrooms and kraut go well when freezing, as does the dough. You may need to cook them for a couple of minutes longer from frozen. Enjoy! Is the pepper quantity an error? I put in one tbs as per the recipe. It totally overpowered everything, couldn’t taste any other elements. I had to rinse it and add more sauerkraut but it is still incredibly powerful. Perhaps it is meant to be a teaspoon?